Just setting up a new laptop here, readers, and enabling Address Book’s built-in sync with Google Contacts so as to bring all my contacts over and… aargh! What is this I see? 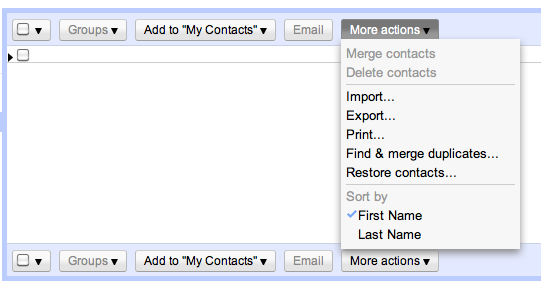 For some reason, the syncing system has decided that the new, empty address book with zero contacts is the up-to-date version, and so has deleted all my contacts from my Google account to make it match! Woe is me! Now, I was about to write this up as a cautionary tale of cloud computing: if I didn’t have my own local copy of my data here, I might have been in quite a pickle. 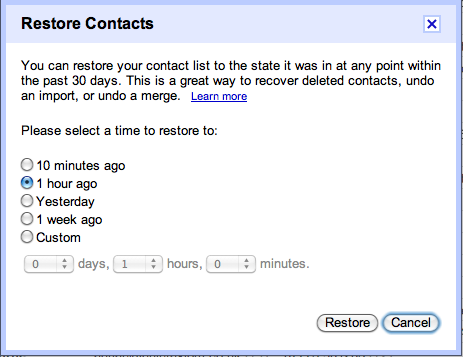 But then I discovered that the good folks at Google hadn’t allowed data just to vapourise… there’s a handy option in the More Actions menu of Google Contacts, which lets you restore your lost contacts.